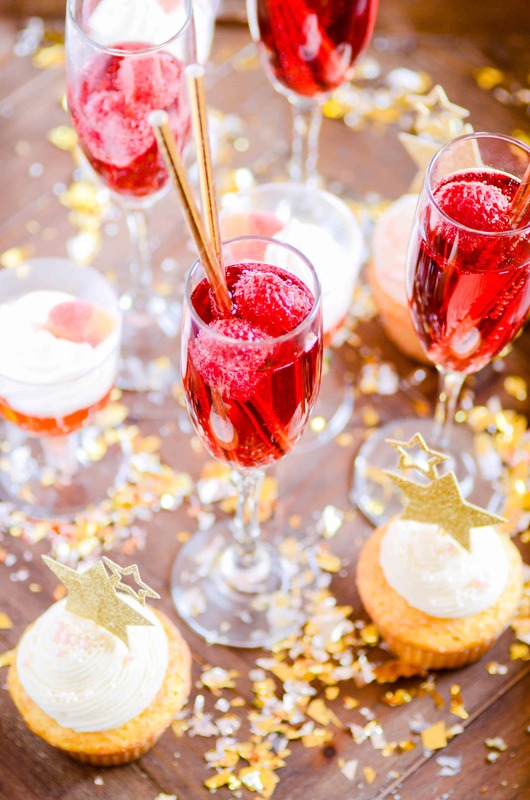 Here are three super easy non-alcoholic NYE treats and drinks that you can pull off at the last minute for the entire family to enjoy. I have to start this post with a confession: this is not what my family actually does on New Year’s Eve. I don’t bake fancy cupcakes or make fancy mocktails in long stemmed champagne flutes. My kids don’t slurp down non-alcoholic Jell-o shots. And there is absolutely under no circumstances ever confetti inside the house. ???????? If you want to see what my family does on NYE, look no farther than this post. We like to make big, yeasty cinnamon rolls drenched in icing. Sometimes we’ll throw in a bottle of Martinelli. And my husband and I usually like to watch Sleepless in Seattle. Our New Year’s Eve is one of our only family traditions that we didn’t borrow from either side of the family, and we love it. 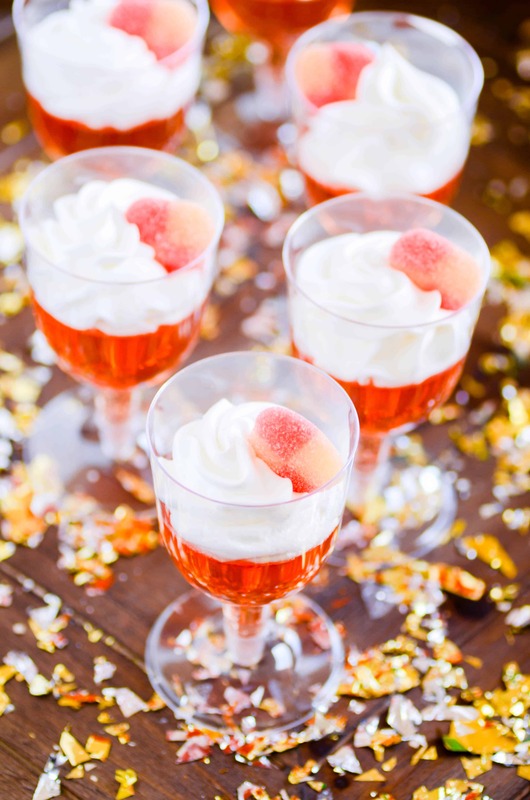 HOWEVER… all that being said– I couldn’t resist throwing together a few last minute NYE recipes for those of you who like to get a little more fancy than we do. Plus, my kids loved testing all these recipes. Which made me feel like all of my motherly holiday obligations have been fulfilled. Win-win. 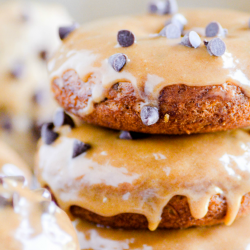 They are crazy easy to make, and people will LOVE them, I guarantee it. To prepare: whisk together 1/2 cup of boiling water with the Jell-O mix to dissolve the powder. Whisk in 1-1/2 cups of sparkling cider and whisk vigorously (the Jell-O in the boiling water starts to congeal quickly once you add the cider). IMMEDIATELY pour the mixture into pretty fluted glasses. 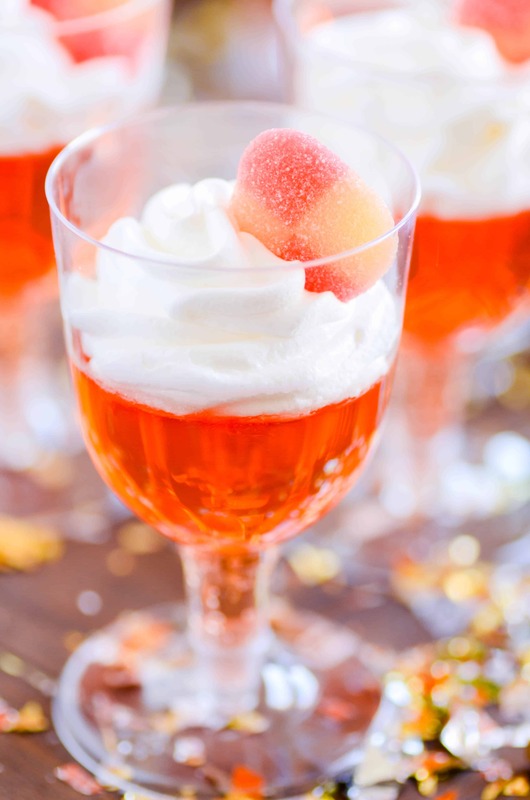 I added a dollop of whipped cream and a gummy peach. Which greatly impressed my 7-year old ????. 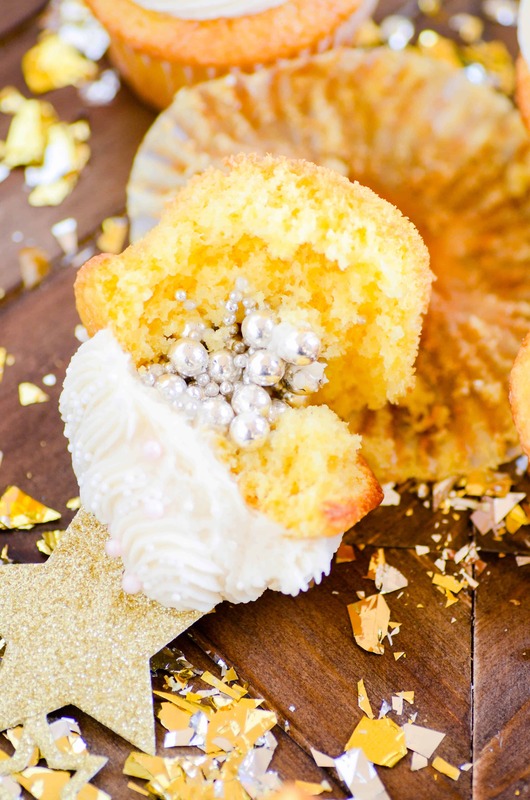 Because obviously your New Year’s Eve needs confetti cupcakes. a shiny confetti center filled with silver dragees. Of course, you can use any sprinkles in the center. But I thought these silver dragees had an elegant look to them. I purchased them at Orson Gygi in Salt Lake City forever ago. But I think you can find similar at any baking or cake decorating supply store. I know Michaels carries shimmery star sprinkles that would work beautifully for this. 1-2 dozen yellow cupcakes baked and cooled. You can use a mix or my Classic Vanilla Cupcakes. A batch of buttercream. Or you can use store bought frosting– it doesn’t pipe as well as homemade, but it would get the job done. SPRINKLES! Lots and lots of shiny sprinkles or dragees. A piping bag and large star frosting tip. To prepare: Use the wide base of the frosting tip to carve a hole out of the top of each cupcake. Spoon sprinkles into each hole, filling it up to the top. 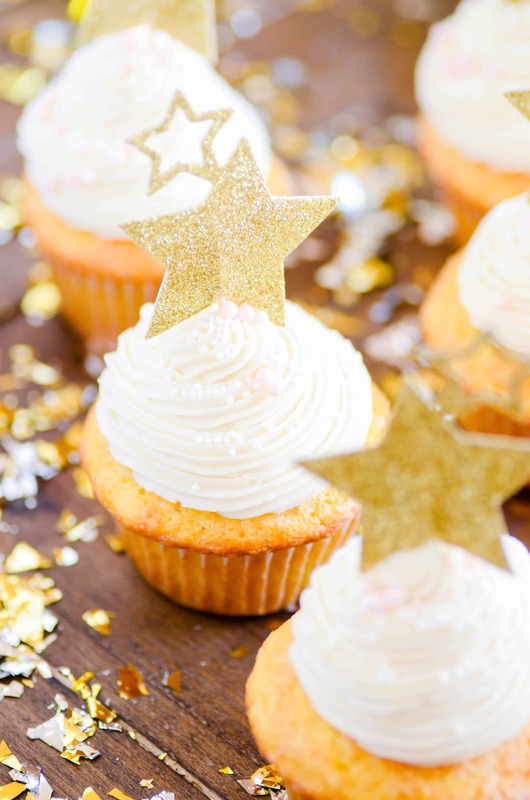 Pipe the frosting on top of each cupcake and add more sprinkles and/or a cupcake topper! **If you use large dragees like I did, be sure to warn your guests that there are hard candies inside! They are totally edible, but you’ll crack a tooth on one if you’re not expecting it. It’s ridiculously simple. 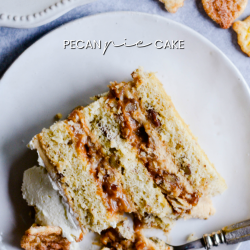 It’s embarrassing to even be sharing this with you as a recipe. But I adore it, and I think it’s as lovely as it is delicious. So here I am, sharing this TWO-INGREDIENT punch recipe with you. 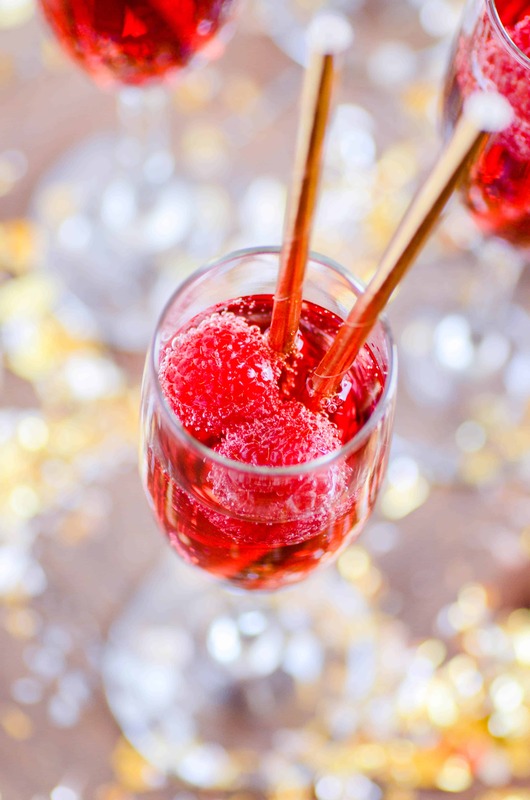 If you serve it in a champagne flute and NOT out of a punch bowl, can we call it a mocktail? It just sounds classier, doesn’t it? If you make it in a punch bowl, you should also add pink lemonade concentrate– it just puts it really over the top. But if you want to serve it in pretty glasses, just fill each one halfway with juice and top it off with sprite. 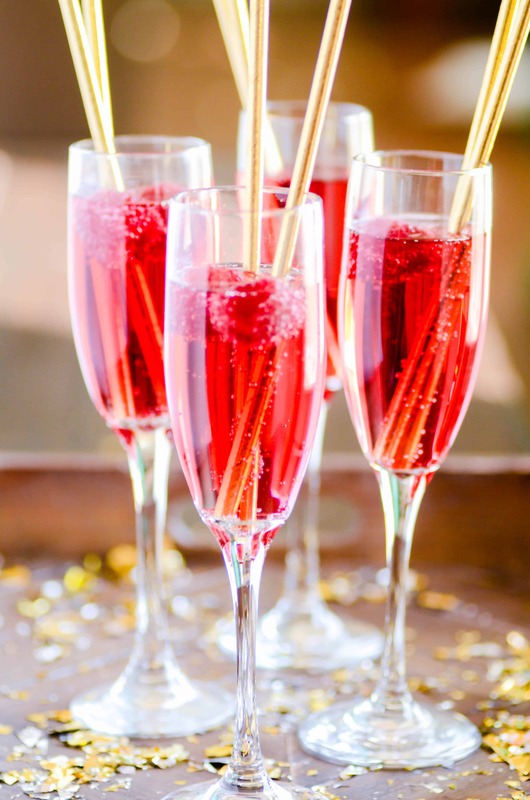 Add a couple of raspberries and golden straws to give it that jazzy NYE feel! Enjoy!!! And have a very happy, very safe New Year’s!